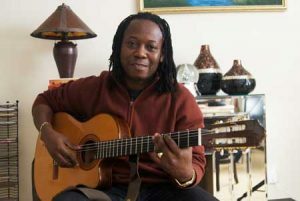 Singer-songwriter, guitarist and percussionist, Aurelio Martinez is one of Central America’s most gifted performers. Born in Honduras, the artist is known for his powerful and evocative voice. He is a major tradition-bearer of the Garifuna culture and music and he is considered nowadays as the Cultural Ambassador of the Garifuna nation. His new CD Darandi is a celebration of his career thus far. Aurelio and Baruch discuss the music, Aurelio talks about Garifuna culture, and we listen to some fresh tracks from Darandi! Music by the Oscar Peterson Trio, and Aurelio Martinez.